Power of faith against bank robbers and tornadoes! Review copy provided for free from LitFuse, thank you! Sometimes it takes a stranger to see you as you really are. Born and raised on sprawling Texas land, Margaret O’Brien prides herself on her competence as a rancher. But her father believes she’s made for more than just dawn-to-dusk work. He wants her to have the love of a good man, to raise children, to build a life. But Margaret gave up such dreams years ago. She’s convinced no man would have her, that the ranch is her life now. (Stand alone, although Safe in His Arms is part of the Under Texas Stars series, the novels follow different characters. The previous novel featured a friend of Margaret's). 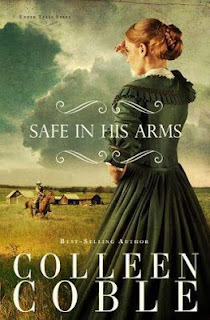 Safe in His Arms becomes a fast-paced western themed romance, with lots of intrigue and faith values throughout the story line. Margaret feels insecure with her looks, and although she is respected as a rancher as a man would be, she longs to be accepted as a woman and to be able to raise a family. Yet with an overbearing father who doesn't know how to show love, Margaret sinks lower and lower into self loathing. When Daniel Cutler comes along and threatens her position as a rancher on her own land, she is thrown for a loop when Daniel professes to admire her. The story was set up as a nice slow romance, with character development that made the reader think we knew who was the good guy and who was the bad guy. When Daniel and Margaret are stuck in the middle of a bank robbing gang, things go from bad to worse faster than a tornado. Action propels us to a swift and tidy finish, with lots of thrills and surprises to boot. I enjoyed the romance and the faith angle, and those readers who are not interested in the faith aspects need not read this one. There was a lot of focus on God, and Daniel and Margaret's faith in Him; I enjoyed watching their spiritual journey as they faced dangers and perils at every turn. The action was indeed heart pumping and I felt some of it got a little muddled while throwing everything at the reader all at once, but I still enjoyed the ride.